Evangelist Baker was born in Joplin, MO to Rev. Marlin and Mrs. Jessie Edmonson. She was reared in a Christian home by a father who was the pastor of 2 churches, and a mother who was well known in their community as a Missionary. In 1970 she received the New Birth (baptism in Jesus Name and in filling of the Holy Ghost) at Zion Apostolic Church, Denver Colorado, under the pastorate of the late, Suffragan Bishop Roland Martin. 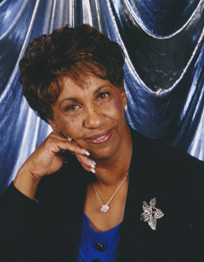 Evangelist Baker graduated from Joplin High School in 1964, and attended Jasper County Community College in her home town. Later she took courses in Early Childhood Education at Thomas Nelson Community College, Hampton VA, which aided her in the position as Director of Christ Church Child Care and Learning Center. Evangelist Baker successfully completed the Ministerial Course from Aenon Bible College, Pentecostal Assemblies of the World, where she received her License to preach, teach, and exhort with all long suffering to those in need of the Word of God. She was elected President of the Virginia State Council Missionary & Women’s Auxiliary and served two terms. She served in her local community as the Program Administrator Assistant for the Lighthouse Outreach Inc. a nonprofit organization that teaches youth ages 12-18 to make healthy choices in their life style. This organization is under the Parent Body, of Christ Church Ministries. Evangelist Baker loves God’s people and has a special call on her life to help the women of God. Her desires to see them become strong and empowered in the kingdom of Heaven, inspired her to establish the “Women of Purpose Conference.” She currently serves as Assistant Pastor of Christ Church, President of the Daughters of Zion Women Ministry Instructor to the New Converts Class, and Minister of Music. Evangelist Baker is the wife of the Honorable Bishop Robert A. Baker, Sr. Founding Pastor of Christ Church Ministries. She is the mother of 4 children, grandmother of 12, and great grandmother of 5 beautiful children.